I studied Jazz at Leeds College of Music from 2010-13. Since then I've worked as a professional guitarist/composer in multiple genres/roles - I've toured the UK and Europe with my own folk project, as well as playing, composing and arranging for multiple jazz/pop/folk groups in Leeds and around the UK. As well as teaching privately, I've spent much of the last 4 years leading workshops on jazz/improvisation in schools throughout the country with the charity Live Music Now, as well as teaching one-to-one/running group sessions in music centres. 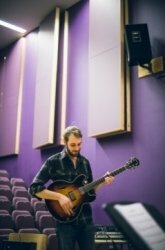 As an instrumental tutor, my aim is to find a way in via the music that each student feels most strongly about - I believe that no matter how theoretically complex or technically advanced the music you wish you could play, there's a way of breaking it down into a manageable, linear learning process. My specialisms are improvisation and solo guitar playing (specifically relating to jazz), but I'm equally comfortable teaching pop and folk performance, as well as beginner to intermediate classical repertoire. For all students (including classical) I recommend an ear-led approach - whether improvising or learning to perform pieces verbatim, I believe having an active, well trained ear is vital to confident performance and a solid musical memory. I'm also very happy to teach with music notation, whether notation reading is the end goal itself or if it just becomes a useful supplement to the material covered in lessons. As well as instrumental tuition, one of my keen interests (as a composer/arranger) is teaching music theory in a way that's accessible, relevant, and will improve a student's performance (as well as their understanding). I aim to incorporate this in some way in all of my instrumental lessons, and I'm also more than happy to teach standalone lessons on music theory, composition and/or arranging.